In medieval times only a few percent of the population could read and write. It must have seemed that these skills needed special abilities, which the majority didn't have. Now we find that just about everybody can be taught to read and write. Some may pick it up easily, others may find learning more of a struggle, but they get there in the end. I do wonder whether today other skills are thought of in the same way, in that we might think they need special intelligence, but in fact could be taught to most people if required. I'm hoping that this book will look into such issues. The book starts with the messages that people can and do change. If we think otherwise it can be a case of defining it that way for our convenience. 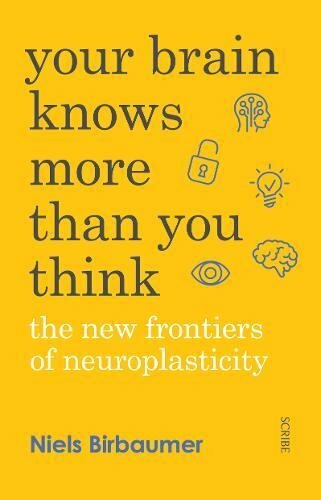 Birbaumer explains that knowledge of this neuroplasticity can be used to treat psychological and social disorders. He tells of how as a teenager he was a member of a street gang, but that the right environment switched him towards an academic career. I'm not sure whether the book will have much about skills and abilities. It has a chapter about savants but possibly not about general intelligence. It still looks to be an interesting read though.